The HP LaserJet Pro p1606dn printer supports duplexing. 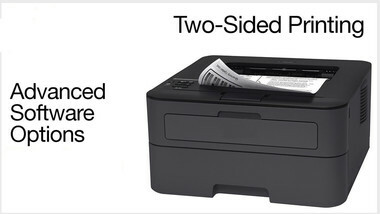 You can print on both sides of a paper with the auto-duplex printing function. Open the installed HP printer driver to know about the duplex settings and set up a print job to print on HP LaserJet pro p1606dn laser printer with auto duplex printing of a paper. Load a stack of plain papers into the printer’s paper tray. Open the file that you want to print on both sides. Go to the File menu and click the Print option. Select your HP printer model from the list and expand Printer Properties. Wait for a while and the Printing Preferences window opens automatically. Ensure that the auto-duplexing feature is enabled. Click the Print on Both Sides (Duplex) option and then the Apply option. Opt for the binding or page flip option and then click Print. Load the HP LaserJet Pro p1606dn printer’s paper tray with enough blank papers to complete the print job entirely and avoid page ordering issues. On your laptop, open the file that you want to print on HP LaserJet pro p1606dn laser printer with auto duplex printing. Go to the File menu on top of the screen and select Print from the drop-down list. Pick your HP printer from the list displayed on-screen and then navigate to the Printer Properties tab. Wait for few seconds and the Printing Preferences/Document Properties window appears. Opt for the Print on Both Sides or Two-sided (Duplex) Printing option from the Printing Shortcuts tab. If your printer driver is out of date, the Printing Shortcut tab may not be available. If so, find the Layout tab at the bottom of the screen and click the Print on Both Sides or Two-sided printing menu, and then select the binding or page flip option. Select OK and then Print. Wait for a while and the printer automatically pulls the papers in and prints them on the other side. This is done due to the inclusion of automatic duplexing feature. You can also perform manual duplexing on the HP LaserJet Pro p1606dn printer. After printing on one side, pause the process, and take the printed sheets from the output tray. With the printed sides facing up, reload the papers into the main input tray. Tap the Continue icon and wait until the printer prints the other sides. Do not print on both sides of transparent papers. Do not use envelopes or glossy papers for duplex printing. Make sure not to use photo sheets as they are sensitive. Ensure that the papers you use weigh more than 16 lbs and less than 105 lbs. Modify the settings under the User Specified Print Settings to exclude the duplex settings for printing in future. To know more information about the HP LaserJet pro p1606dn laser printer with auto duplex printing solutions, make a connection with our tech experts.